According to Huff’s Optical Components blog, the Avago MicroPOD optical transceivers combine 850nm VCSELs (vertical cavity surface-emitting lasers) and PIN photodiode arrays to create 12-lane, bidirectional optical ports that can drive the 12-fiber optical ribbon cable shown in the image above. Each lane can operate at data rates to 12.5Gbps for a raw aggregate bandwidth of 150Gbps in each direction over the fiber ribbon cable. For this week’s demonstration at OFC in Los Angeles, Altera showed the FPGA driving the fiber link with 100GbE data. 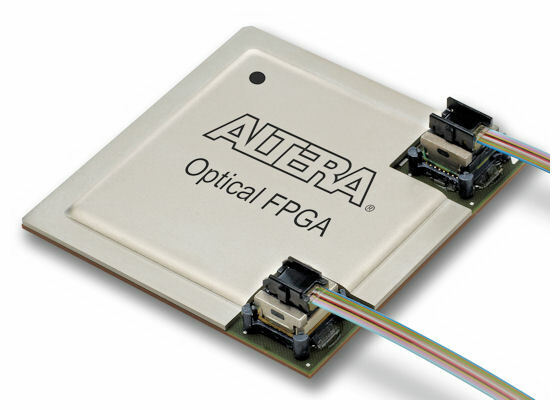 To get those kinds of data rates, Altera employed 3D assembly techniques so that “the electrical signal path from the I/O pad of the chip to the input of the optical transceiver has been reduced to a fraction of an inch. 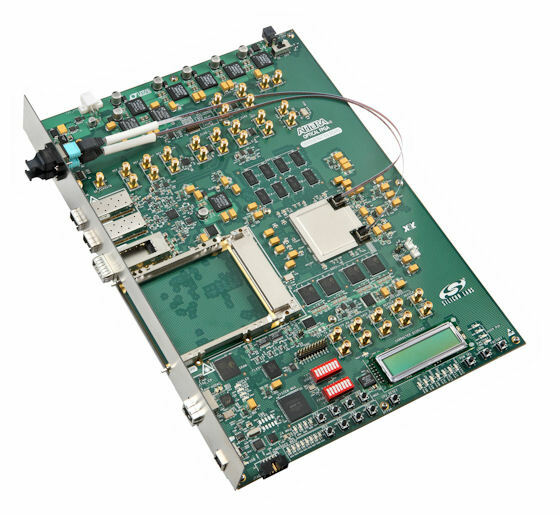 The shortened communication path between the I/O transceivers on the FPGA die and the optical components in the Avago MicroPOD reduces signal degradation and jitter, improves signal integrity and reduces data errors caused by parasitic elements in the signal path. As a result, the full data path through the FPGA transceivers and optical modules to achieve a bit error rate (BER) of 10-12 or better. The Avago optical modules are not just mounted on the Altera FPGA—the FPGA provides heat sinking for the modules to keep them within their specified operating range. The FPGA also monitors the optical modules’ temperature and laser bias currents through digital diagnostic monitoring to help prevent link loss. For more information on the Avago MicroPOD modules, see this detailed White Paper. This entry was posted in 3D, EDA360, Packaging, Silicon Realization, SoC, SoC Realization and tagged Altera, Avago, Fiber Optics, FPGA, IBM, Molex. Bookmark the permalink. Great summary! Thanks for the plug for my blog Steve! Thanks for dropping by. I really like your blog and appreciate the research that went into the post I cited.